It is easy to neglect la Grande Sure. It fails to reach the magical height of 2,000 m; it is somewhat tucked away from the rest of the massif being on the western edge; and it is not easy to get to from the main centres. Moreover, when seen from a distance, it doesn't look particularly interesting, seemingly being a mass of forest-covered lapiaz rising to an indeterminate summit. For those people who do make the effort to get to know it from close quarters, however, it is a delightful place of secret valleys and beautiful forests. La Grande Sure is part of a huge area, stretching from St. Laurent-du-Pont in the north to Grenoble in the south, and from the Col de la Charmette in the east to Voreppe in the west (map). Most of the outer sections are forest-covered slopes, but the centre part has a long rocky anticlinal ridge stretching for some 6 kilometres north to south, of which la Grande Sure is the highest point. Yet further east is an equally long exquisite valley bound by the main ridge to the west, and another smaller, but vertical set of cliffs to the east. To the east of that is a kilometre or so of complex forested lapiaz that is a delight to walk through. Of the six walks described, the first makes a directissima ascent of the west cliffs of la Grande Sure, and involves a Grade 2 scramble, and the second is a delightfully relaxing walk that explores the central valley. The next two are two circular walks that explore the southern half of the massif, and the fifth is one for connoisseurs that follows an exciting old chamois hunters path through the cliffs above the Roize. 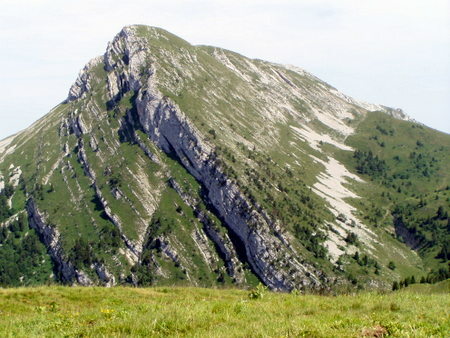 The final one ascends the outlier Rocher de Chalves from the east. There are many more walks to be had in the area.